This week, Robyn is Dazed’s guest editor. See all the articles from her takeover here. It’s an early August evening, the night just turning navy over the playdough-yellow bump of Pikes hotel in the Ibiza hills. This spot, its grotto walls slick with debaucherous pop history, is where Wham! filmed “Club Tropicana”, and where Freddie Mercury held one of his last legendary birthday celebrations. Tonight, it’s where Robyn is hosting a party. The Swedish popstar moves lithely behind the decks in the sloped, sweaty club space, wearing one-legged purple fringed trousers – custom-made by a friend for a Prince-themed party gone by – and a plain white t-shirt. Holding a glass of wine, she’s selecting fizzy disco and earthy house tunes with her friends and collaborators Kindness and Mr Tophat. As the party runs into the small hours, she peppers the set with Pablo-era Kanye, Michael Jackson, and a thumping new tune of her own. Hands reach out to her from the sweaty haze, as the clubgoers chase the warm glow of acknowledgement from the pop innovator. It’s been eight years since Robyn’s revelatory Body Talk. At that point, she had broken free of her record label a few years back, and was ready to declare her independent self with a saga of mini-albums. These records became the blueprint for cardinal, emotionally cavernous pop. 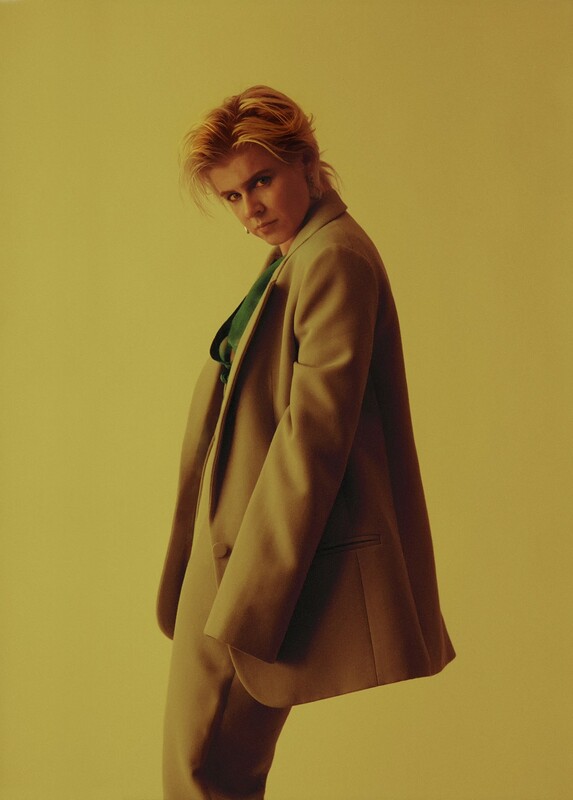 Robyn and her back catalogue – including a smattering of collabs, guest features (The Knife, Neneh Cherry) and a pumping remix album – have left a vestigial spool of thread through the music industry. She’s an artist’s artist, revered by other pop stars: Lorde shook up Saturday Night Live with a framed photo of her by her side in 2017, and a stripped-back version of “Dancing On My Own” by British singer Calum Scott stormed the UK charts the year before. Her expansive form of aching dance-pop permeates the new generation of stars (Lorde, Zara Larsson), soundtracks the TV shows we watch (Lena Dunham’s Girls, Orange is the New Black, iconic Drag Race lip syncs), and remains a staple on personal playlists that we turn to to untangle our euphoria or devastation. Some of us have played all the parts in “Call Your Girlfriend”s love triangle; many of us have raged to the ferocious “None of ‘Dem”, and all of us have thought about crying in the club to “Dancing On My Own”. On the day of the Ibiza party, Robyn has finally shared the first single from her long-awaited follow-up to that iconic trilogy: the effervescent “Missing U”. As the introduction to her long-anticipated sixth album Honey, its ricocheting synths build up to a heart-on-sleeve edict about loneliness and a life-affirming love. Robyn put it out into the world as a bridge to excited fans, but it’s also a snapshot of the grieving and heartache she’s been through in her eight year absence. We speak on the veranda overlooking a narrow pool, a raked garden, and small plot of stout cacti. Bleary-eyed friends drift in and out of open doors and shaded enclaves in the mid-30s heat. Kindness (aka Adam Bainbridge) pads around, letting everyone know his intentions to make some eggs. Robyn’s wearing a caged white bikini, her palette muted like the villa walls. In her time away, she split and reunited with her long-term partner, photographer Max Vitali. Though she let herself enjoy singledom – clubbing in Ibiza, New York, and Stockholm – it was a dark period, without the record-spitting work process as her grounding force that she had relied on early in her career. Robyn also had to deal with the loss of her collaborator, producer Christian Falk, in 2014 to pancreatic cancer. She began unpacking a lot of complex issues, with death, loss, self-image, and her relationships, with the help of intense psychoanalysis over more than half a decade. “It is a kind of self-care, to be so open to tackling your grief and sadness,” she says. Taking time to herself, to “be uncomfortable in the in-between space”, was vital for her to continue, as an artist and a person. Robyn began touring when she was only six months old, with her parents’ Swedish theatre troupe Scheherazade. She was discovered aged 13 at school by the visiting band Legacy of Sound, when singing a song about her parent’s divorce, and began a serious recording career at 15. She was paired with career-defining producers Klas Åhlund and Christian Falk in her later teens, but then broke free of her contract in 2005 to kickstart her own label Konichiwa Records, taking time to recalibrate her persona and move away from the good girl, role model image they wanted to impose on her to break the wider pop charts. The years have been whirlwind, tumultuous, and full of revolving names and faces. She didn’t know what she was searching for when she began the very different process for Honey, in solitude. “Working alone, spending time alone and enjoying doing that was what helped me to go back into actually enjoying making music again,” she explains. “I wanted to really take my time, so I wasn’t just delivering something that I thought people wanted to hear, but something that came from an intuitive place. I needed to shut out the world so I could hear myself a bit better. This process saw Robyn take a year on her own back in Stockholm, learning production on a non-profit course that she helped to develop further with her own tech festival Tekla. While sticking with Logic, the music programme she’d been faithful to since the 90s, simple but punchy synth software Sawer, and an old analogue LinnDrum (the same machine that gave Prince his bounce), she was learning “hypnotic”, weird rhythms, letting things be “awkward and undefined” in continuous loops in a studio by herself, like the trance and rave tunes she heard out in clubs. This experimentation was fundamental to developing the sound for Honey, its title track becoming Robyn’s “stalker-like” obsession and a song she later “drove everyone crazy” with in over 20 versions. “Let go of your doubt say yes / let it soak up into the flesh / never had this kind of nutrition,” she sings. With the bare bones of her next solo work, she initially didn’t feel ready to show it to anyone: “I didn’t feel like I was able to protect my idea, or to really communicate it in the way I wanted to.” She found inspiration in Michael Jackson’s electrifying Thriller and Off The Wall demos, as well as in Ibiza clubs, seeing acts like DJ Koze and Todd Terje move balearic crowds. She then sought out her longtime collaborator Åhlund and Metronomy’s Joseph Mount to develop the sound and mood of her new era of pop songs without a defined beginning or end. Honey sounds much softer than her previous output, and in talking about it, Robyn keeps coming back to the word “sensuality”. There’s a connectedness to sorrow and extended heartache that replaces the steely sass of Body Talk, as Robyn no longer dances through the pain, but lets herself be suspended in its wave, before it breaks spectacularly on the shore. “This set of songs is okay with the fact that there is not always a happy ending,” she affirms. “I'm sure that I'll make some of the more feisty, fierce, ego-centric stuff again.” Referencing her defining feminist cyborg identity, she thinks the key difference is that she’s “human” this time. The concept of the fembot permeates contemporary pop – see the Y2K aesthetics of Rina Sawayama, the Kubrick-esque creepiness of Poppy, and Charli XCX’s slick, future-exploding output. “Hot-wired if you mess it up / I’ll self-destruct,” warns Charli’s “Femmebot”. It excites Robyn, but it’s a path she’s choosing to turn away from, for now. Though it wasn’t engineered to stir commercial success, Robyn’s absence from the industry has made many hearts grow fonder, and the stans ever louder. #ReleaseHoneyDammit has been a homecoming rally from her fandom for months. Her stans don’t have a collective name, but they have a ton of heart and faithful social media buzz that’s been humming in her ears for some time. “Missing U” dropped at roughly the same time as her short film “A Message To My Fans”, showing the singer at a Robyn fan night in Williamsburg, Brooklyn. She’s shown listening intently to dozens of fan declarations to the power of her music via voicemails. “I love when people mirror themselves in my music, and I think that’s the whole point of it – not telling people what it is or how they’re supposed to feel... but you having a relationship with my song makes it real to me,” she says. She feels no pressure now, and it shows – in the sweet, bubbling honesty of “Honey”, at home in the sweaty DJ booth, and doing the Cafe Mambo sunset show of her biggest hits to a crowd of sunburnt teenage revellers days later for Radio 1. It also shows in the humanistic approach she takes to music, as the zeitgeist propels towards the metallic new age she once spear-headed. She’s grown older and more comfortable with the unknown, in an industry that evangelises youth and clear-cut messages. When Dazed last sees her before departing Ibiza, Robyn is working on her next music video, again at Pikes, this time in the daylight and wearing a golden yellow two-piece suit. She’s animated yet attentive, focused and free – an artist happiest in her soft, ever-evolving, never totally final form.